When Melissa Hampton needed an advance on her weekly paycheck she borrowed $150 from a local loan store in Prestonburg, Ky., and promised to pay it back plus a fee. Six months later, Hampton was still low on cash, but now owed more than $1,000 in fees to the loan store, which threatened to throw her in jail if she didn’t pay up. “By the time I got off the phone, I was scared to death,” said the 23-year-old Lexington, Ky., housewife, who’s debt eventually forced her into bankruptcy. Payday loan “businesses” seem to be reproducing at an alarming rate. Just in my small town alone I would guess I’ve seen around 6 of them! In fact, it’s been reported that there are 10,000 such stores in operation with revenues of $2 billion in interest and fees. These “businesses”, or houses of financial prostitution, prey upon those that are either down on their luck or illigally in the country and cannot legitimately open a bank account. Either way, these businesses use flashy advertising and deceptive promises to cover up the horror that is found in their seldom-read “customer agreement” in which you sign away your money, assets, and sanity. With that said, you can probably guess that my first and foremost recomendation is to stay far far away from any business with the words “check”, “city”, “payday”, “postdated”, “car title”, or “loan” in their title. However if you are one of the too many people have that have received a payday loan – for whatever reason – then read on for some ideas and suggestions for escaping the payday loan death spiral. Read Your Agreement – go back and read the initial agreement you signed. Learn about the company’s policies and procedures, its interest rates, and any other information you can glean from the document. That document, and knowing what it contains, might serve you well later in the process. Check State Agency – fortunately many states are realizing the negative impact of payday loans and have placed resources available for getting out of the death spiral. Check with your state’s Department of Financial Institutions or similar agency to see what your state has to offer. Stop Rolling the Loan Over – sometimes the worst part of the loan is rolling it over. A PIRG report on payday loans reported that in one state 77% of the loans were roll-overs! Each time you roll over your debt for another two weeks, you’re not only paying the loan service fee (anywhere from $25 to $125) but your interest payments are climbing exponentially. Check out the graph below to get a glimpse of what I mean. If you take out a $500 loan and keep rolling it over for 60 days then you are going to pay as much in interest as the amount of your loan – if not more. 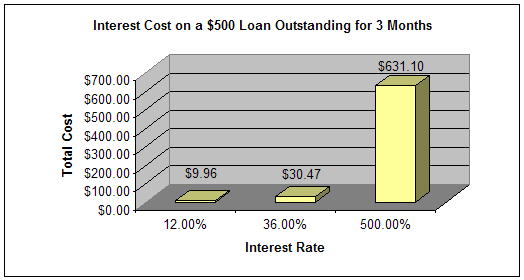 And keep in mind that this graph is conservative – payday loan interest rates have been reported as high as 1,600%! Do NOT Get Another Loan – many people think that by getting a loan form another payday loan store to pay off another payday loan debt is a good idea – IT ISN’T. In the end you’ll end up paying the same amount in interest and fees as if you had just left it at the first house of financial prostitution. Cut Expenses – you should treat your situation as seriously as if you were drowning because financially you are. Start to cut expenses – you know, those little things that you “can’t live without.” You would be suprised at how easy it is to part with a cell phone, your Netflix subscription, eating out during the week, etc. Those precious dollars should be paying off that high-interest debt before anything else. You can think about adding those items back to your life after the crisis is over and after you have planned on how not to get into the same situation again. Use a CC Cash Advance – I know you’ve been taight to avoid credit card cash advances, but the 35% from the credit card company pales in comparison with 500% from downtown. Plan – the next step is to calmly sit down and plan. This is going to take some time, discipline, and sacrifice on your part. Take all of the above suggestions and weight them out – try and think of pros and cons and how they would affect your individual situation. Write the plan down! Refer to it often to remind you that a Mig Mac today is just not worth it. 401l Plan – consider taking money from your 401k plan. Any withdrawal will be subject to a 10% penalty and will be added to your taxable income for the year. So youll probably lose 20% of the withdrawal to the federal government. But that’s better than paying 500% APR. Borrowing from your 401k plan would provide the money you need now and allow you to pay it back through payroll deduction. You should speak with the human resources department to find out the details about a 401k loan. The biggest advantage is that money borrowed is not subject to tax penalties or added to your income for tax purposes unless you don’t repay it. For those of you who haven’t fallen into the black hole, here are some tips on avoiding or choosing alternatives to payday loans – some of which have already been mentioned. Ask your other creditors for more time to pay your bills. Find out what they will charge for that service – as a late charge, an additional finance charge or a higher interest rate. Hopefully after reading this you understand the gravity of payday loans. So please do me a favor and promise me you’ll never EVER get one! My brother-in-law and sister own a payday loan shop. The whole idea behind the scheme is to charge enough in fees that the person has to come back the next week and get another loan. It isn’t ethical but the goal is to build a clientele that is dependent on the loans for the rest of their working lives. I don’t think I could live with myself if I did that. They should really outlaw these places. Not only do they prey on illegal immigrants and the financially unstable, they also prey on those who are (or have been) physically or mentally ill and rendered incapable of managing their finances. Personally I’ve gotten myself in way over my head with not one, not two, but THREE different payday loan places. I currently owe over $1800 to two of them, and I just paid off the third one a couple weeks ago. It’s such a hard thing to get out of when you can’t get any other credit. I don’t even know how many thousands of dollars I’ve given these places over the past couple years in broker fees, ‘payer protection plan’ fees, cash card fees, withdrawal fees, check cashing fees, interest fees, insurance fees, term fees, collection fees and ‘other’ fees, I don’t even want to know. I’m not even making these fees up, they are actually listed on my various loan agreements. It’s scary. I’ve lost thousands and thousands of dollars to these places in a very short period of time. I also started out with a little $200 loan. DON’T DO IT. Nice site! You got some useful information. I am deep in my home loans. I hate it! My husband and I are paying off two right now. The thing that has us frustrated is the deluge of advertisements not only in our emails everyday but on the cell phone, most of which have no available page to unsubscribe from. The cell ads are the worst, they want you to pay to send them a text message saying you want to unsubscribe. We really did this in a desperate time of need (we never go out, and our cell phone is emergency only with no home line, and I am a full time student) but we are through. I would rather hit the rough patches and really struggle for a while then be a part of this ever growing financial epidemic that has even been in articles in Business Week the past few issues. Most people that are in the market for a Payday Loan do not have a 401k to sac, other then that good article! It is sad how these apparent, proven evil operating places as payday loan companies are still there as they need to be shut down totally. Payday lender shall be the #1 job listed as making the world a worse place truly. Seriously, I wonder what goes on in the very minds of workers in these payday lenders and how soul sucking it would be seen as ever. Why can’t all these corrupt, immoral payday lenders be shut down for good?